ABC Observation From Small- this form includes a key where you can mark a letter to document multiple target behaviors without as many details. 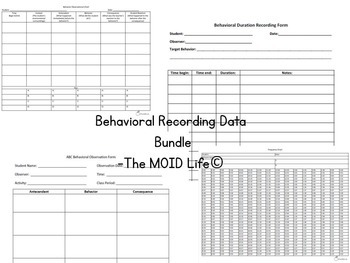 ABDC Observation Form- Allows you to record antecedent, behavior, consequence, and student reaction using a key, with room to write detailed descriptions as needed. *More times can be made upon request, just let me know what your school times are and I can create another frequency chart for you! Also included is a HOW TO document to give you ideas of how to use these behavioral recording forms as you need them.